I am going on a diet. There. I said it. On a public forum, no less. So, guess what, readers? While I have a back log of things to post about, I will also be adding recipes for the things that I posted. Aren’t you excited??? The recipes are going to be like extra posts. I will put the picture and recipe on a post all by itself and it will have its own category so that you cooks and bakers out there can find them easily :). I just can’t cook and bake these delicious non-diet foods and not indulge in them! It’s just too hard. I have to taste things so I know what they actually taste like and so if they can be improved, I know what to change and what to leave alone. Ok, rant over…on to the deliciousness that I made the other day at the request of my sweet hubby :). I have made this dish before, and knew that if I ever made it again, there were some things that I wanted to change to bring it closer to the the original. I am talking about Panera Bread’s Sanoma Stew with their Dry Cheddar Jack Biscuits. If you have ever had this delicious goodness, you know what I am talking about. 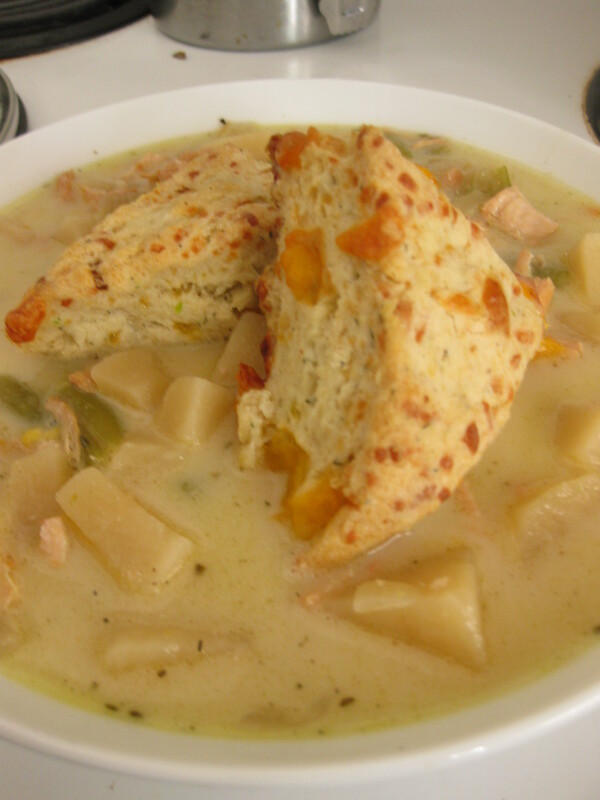 It is creamy, savory and satisfying, with the extra kick of the cheese in the biscuits that melt just a little as you break them up in the stew….my mouth is watering just thinking about it! Well, My best friend and I used to (notice the past tense here) go there every Saturday on our Girls Night Out and get a bowl of this stew. I mean EVERY time! We absolutely adored this stew! It was like manna from heaven. Then one night, when we were desperate for something to eat (we had been playing a little to long), we stopped in at the closest Panera and were all set to order a bowl. To our surprise, it had been removed from the menu! Gasp! What were we supposed to eat now?? The only thing that kept me from walking out was the fact that I was to hungry to drive anywhere else! I asked why they didn’t serve it anymore, and they told me it was a seasonal item…..ggrrrrr, ugh, and all other unhappy sounds. We were SSOOOOO not happy! Right then and there I decided that I was going to try to recreate it at home. I had already figured out the that the “biscuits” were actually savory scones. Easy Peasy…I knew how to make scones, I just had to figure out the right flavor profile. The cheese was obvious, Cheddar and Monteray Jack cheeses, but the other ingrediants were a little more involved. The first time I made the scones, they were good, but they weren’t…right? I guess. After doing a little more research (a.k.a. 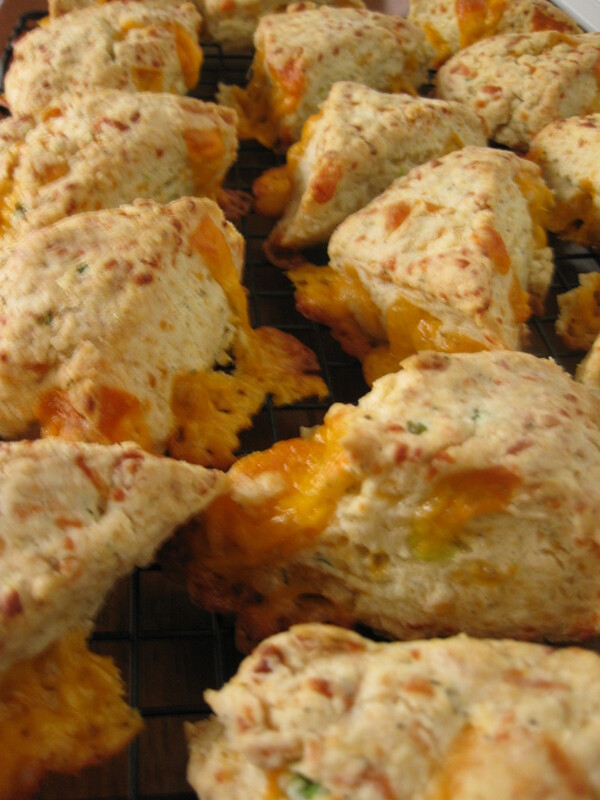 reading LOTS of savory scone recipes) I discovered something that my scones were missing. These recipes called for an egg to be whisked into the cream…..I didn’t do that! I made perfect sense to me, though. That was definitely what my scone was missing texture-wise. Anyway this is the batch that came out perfectly, taste, texture and all things delicious in a savory scone! As for the stew, well, that was way more involved. Luckily for me, I had managed to get my mom to have some of Panera’s stew before it dissappeared. I remembered her making the comment that it tasted a lot like our Chicken Pot Pie filling. That did it for me. I knew that recipe by heart so I knew I need those basic ingredients, but I also knew there was a little more to it than that. I knew I need to cook it for a LONG time. I knew that I needed to make sure that the chicken was cooked and flavorful before I even added it to the rest of the stew ingredients. I knew it had to be creamy, but not to chowder creaminess. Like the scones, the first time was close but not quite there, even though it tasted good. My hubbs was blissed out after the first bite. He liked it so much he made sure he took it to work for his dinner, along with several scones 🙂 I love when he loves what I made. It makes me feel like all my work was worth-while. As I mentioned above I will be posting some of the recipes for the things that I have posted, adding more as I go so, Stay Tuned…..
← Happy National Chocolate Chip Cookie Day!!! Whats up, This is a good summation, I located your blog checking google for any similar subject and observed this. I couldnt discover as well much other tips and information on this posting, so it was fantastic to find this one. I’ll almost certainly be returning to contemplate many other articles that you have written another time.